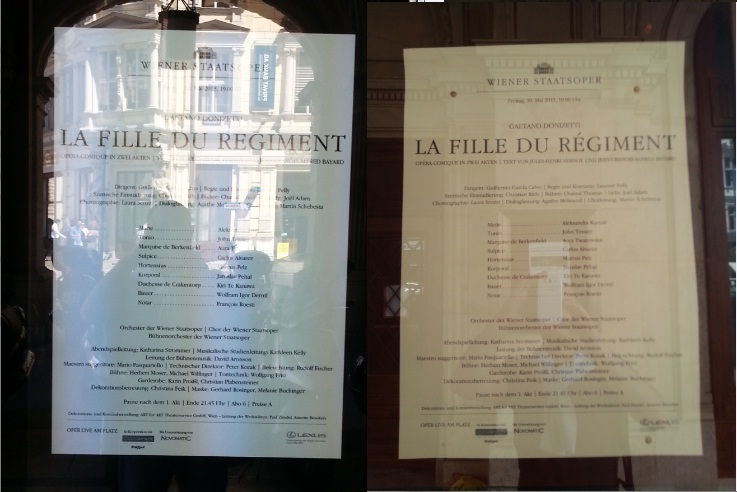 Digital signage vs paper poster in Wiener Staatsoper: spot the difference ! 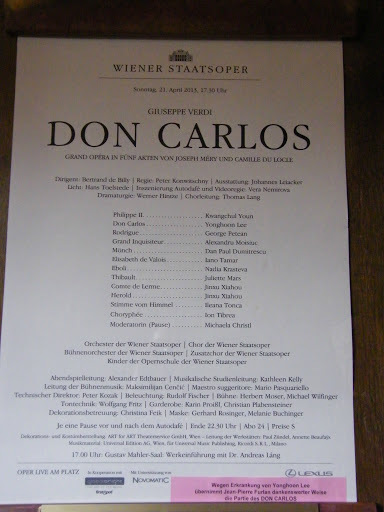 Digital signage and paper posters are both used to promote and inform loyal audience as well as numerous curious onlookers going around the well-know Wiener-Staatsoper (Vienna State Opera House). Due to reflects (indeed it is sunny weather in Vienna in spring! ), it not really easy to distinguish one from another ! 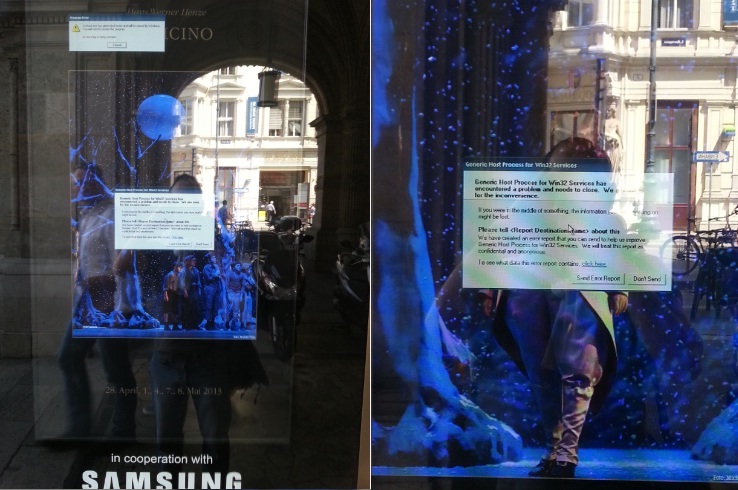 Have you found ?… First is a digital signage provided by Samsung, second is a paper poster behind a window pane. Despite their being subject to reflections, there are several main differences between digital and paper poster. Correctability : It refers to dynamic versus static. Paper is rather static though there are now available tools to make it less static : once it is printed and posted, if you want to change you have to put a paper ribbon to correct like the following where Jean-Pierre Furlan replaced Korean Tenor Yonghoon Lee in last April. As digital signage can display pictures or word, pdf or spread-sheets document, you can modify at no cost. Discoverability : It also refers to dynamic versus static. With digital solutions you can more easily share the spot and enable more complete message. For example to complement the cast, you can display pictures of the artists involved or from the very production. Like in this production of Donizetti’s La Fille du Régiment. A digital carrousel is indeed used to display cast involved or particularly appealing pictures of the set design. Monetisation : Here, in Wiener-Staatsoper I would say that finally paper’s winner ! Indeed in this opera House (as well as in Volksoper), paper posters have a second life as public can pay 2 euros to purchase one ! Indeed some operagoers do want to get a memory or just build a collection of posters (like me :). Still plenty of good ideas or initiatives are available for digital signage display. Potential is clearly still untapped to monetize digital poster. Archivability : Information is valuable. 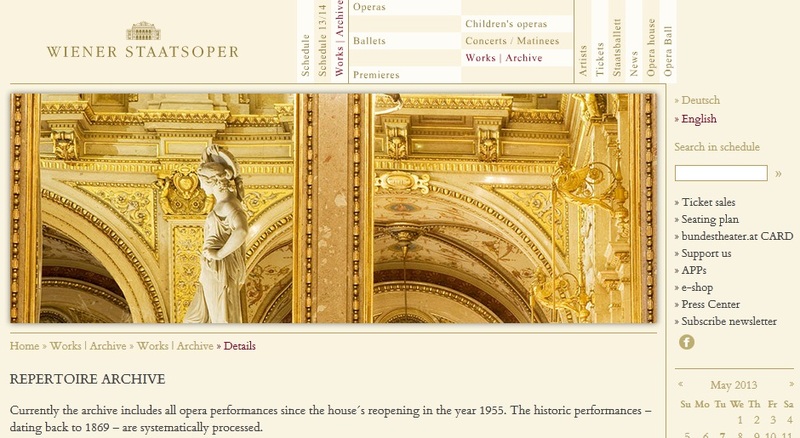 In Wiener Staatsoper you can find all the casts of each performance done since 1869 on the website. With digitalisation it could be more easy to archive and back-up information. Environment Friendliness: Even if I did not find any data regarding carbon footprints of both ways of promotion, I guess that digital display is in fine more ecological as it does not rely on forest resource to display. Yet it uses some energy but in a country such as Austria where power production relies more and more on renewable energy I am quite confident :). Digital signage and paper display have both their pros and cons but digital to my mind is clearly ahead regarding flexibility and enhance experience it can foster. Digital signage on opera house or cultural institutions has been developing but it still used in a quite traditional way. They still have to explore new tracks to enhance experience offers to both prospects and or frequent operagoers. Opera-digital.com can be helpful monitoring and parsing all digital initiatives and projects carried out both by classical music institutions all around the world and other economic sectors. 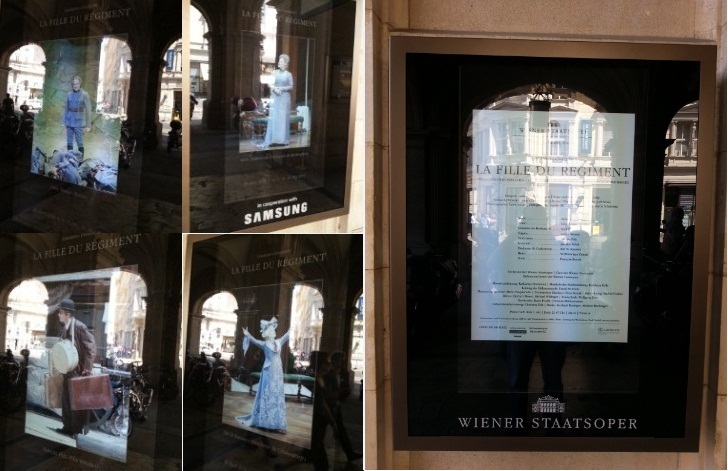 Digital signage vs paper poster in Wiener Staatsoper: spot the difference game ! by Ramzi SAIDANI in under terms and conditions of the licence Creative Commons Attribution 3.0 France. This entry was posted in digital & classical, Institutions & Digital, Vienna State Opera and tagged digital signage, display, promotion, Samsung, Staatsoper, Wien by Ramzi SAIDANI. Bookmark the permalink.